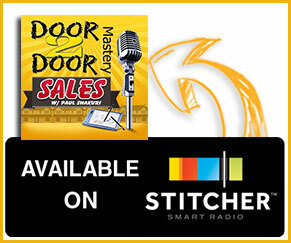 What’s happening door to door mastery fans?! What is happening successful door knockers?! 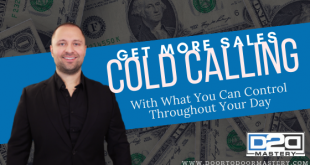 Yes, I am reaching out to all of you out there, and am focussing today on bringing you more information, quality content, to get you to that next level to be able to close more sales today! Let’s talk about the details about going out and knocking the full day with your full potential! How many of you have gone out and have not completed the full day’s work and gone home early? Have you had a day where you did not go out because you were not feeling well? The majority of people who do this fear rejection. They feel that they are not going to get a sale! They think that they are going to go out there and knock all day and not get a sale. Now, I felt the same way and experienced the rejection as well. But it never entered my mind whether or not I was going to get a sale. Understand that you may not have the skill to close a sale every single day right now but if you allow that emotion to overtake you, then you will never get a sale. You need to take control of your emotions! If you talked to zero people today, what are the odds of you getting a callback or closing a deal? It just will not happen! You have to take action! The more doors you knock on, the more people you talk too, the higher the chance you will close that sale! Most importantly, the more doors you knock on, the more educated you become and as a result the better you will get from gaining more experience. Be in tune with the way you are knocking! Learn from your approach and lack of approach. Every door you knock on is income if you continue to push through until you get your sale. One thing I did was I tracked how much money I was making in a day. I calculated all my commissions in a day per door. For members of my Masterd2d.com program, you have my worksheet that lists out the homeowners that you talk too. You have the sheet that you can download and with that worksheet, you can calculate exactly how many doors you knocked on and how much money you made. Let’s just say you made 500 dollars in a commission that day and knocked on 500 doors. You take 500 dollars and divide it by 500 doors and that works out to be 1 dollar per door. Don’t worry you will not knock on 500 doors. You made 1 dollar on every door you knocked on. Is this a different angle of looking at it? It has helped me and the students I coach on a daily basis by viewing door knocking from this perspective. Ask yourself, how many doors did you knock on? 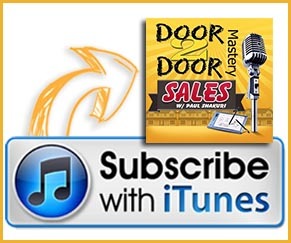 If you’re not knocking on any doors then you’re not closing any sales! If you are not leaving business cards at any doors then you will not close any sales! The chances are zero if you do not put in the effort. For people that want to get business cards, I highly recommend getting a 1000 business cards. I used to do this for all my actual knockers. Cards are literally $27.99 for a 1000 high quality. These cards show validity in who you are, what you’re doing and what you represent. People will take you more seriously because it gets rid of the ill feelings that you may be a phony. You hand the card showing that you are a company! You have set the potential chance of them calling you back because you gave them that business card. If you do this for 1 in every 1000 business cards you go off, you can easily get ten sales from that. So, this is another way you can increase sales. The big picture! How much money you made at the door is important but what’s also important is knowing how many homeowners you talked too. You can break it down into more details. Estimate how long you talked to each person and divide that with how much you made. Estimate how much you make knocking on each door. These points are what you need to focus on. You need to get yourself out of a rut and start looking at your profession and the results in statistics. All wealthy people look at door knocking in statistics. 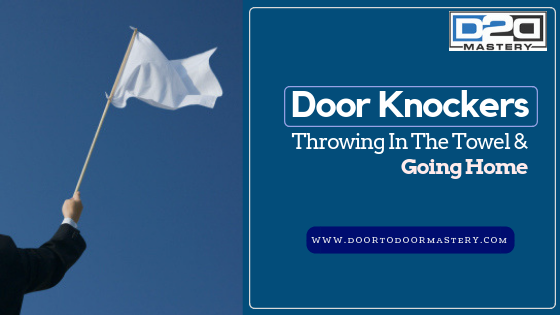 I think of door knocking the same way as I play sports that I enjoy. Take hockey for example; I always think of what pass I could make or take to set up and get a goal! That emotion is transferable to door to door sales. You have to think of enough pain stepping off the ice knowing that you did not score a goal. It’s the same thing with sales. You have to get a sale because the emotion of not getting a sale is going to hurt so much that it hurts more than me not even going out there and attempting to get a sale. The emotion overpowers you. Understand that in order to drive sales, you need to push and work so hard out there that you’re doing whatever it takes that’s reasonable to get that sale. The massive pleasure that you will acquire when you get that sale has to be combined with the understanding that all the doors you knocked on helped you get that sale. Remember, you use even more energy at the next door even if you got rejected from the previous door. Do not get emotionally scarred when you get rejected. Move forward and keep the energy coming. Now, Lee M. has this message for me. “Hi Paul, I am a solar leasing sales rep that is having very few appointments set by my telemarketing crew. I have never done door to door before in any capacity. My sales manager has spoken to me about canvassing before and until today I did not even know what that was. All I was doing was putting door hangers on doors in hopes of a response. We do not sell on the spot and it cannot be done that way because we are dealing with tax credits from the states and government so all I am trying to do is get them interested to set up a time to see if they qualify at a later date…” Lee, that is a big waste of time. You need to ask yourself is it profitable. Are you wasting time? If you are a salesperson and you are just putting flyers out and not talking to anyone then you are wasting your time. But if you are a salesperson who is knocking on doors and they don’t answer and you put a flyer in, well, your leaving a footprint there. People who knocked on doors and gave flyers and postcards to people they talked too ended up getting those sales. Communication needs to be there! Why do you think ads on television are less effective? Also, the way people are advertising these days is different from times before. makes sense and I want to thank everyone for reading along.